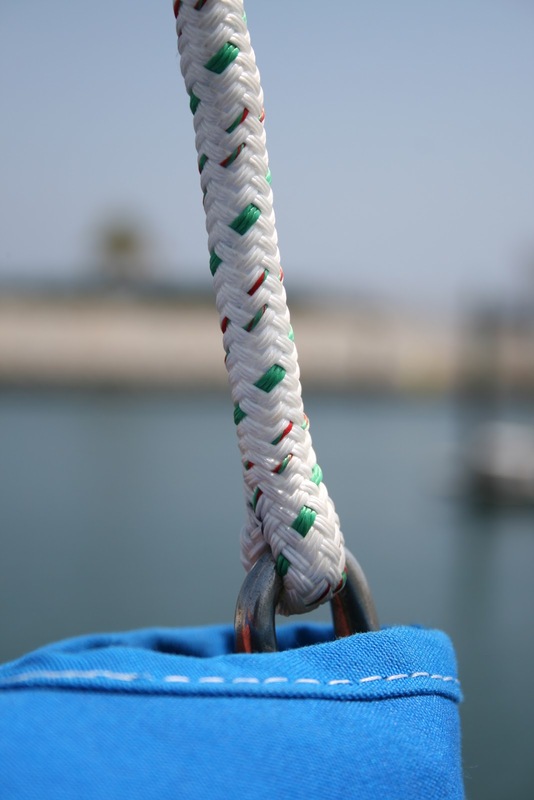 The topping lift for our mizzen boom was fraying badly and after 25 years of faithful service, needed to be retired. However, the previous lift was spliced onto the shackle and I had never been successful splicing the double braid line. Even though there are riggers in the area, I decided that it was time for me to learn this skill. Whereas I have detailed instructions, they're almost impossible to follow. My first attempt was a complete failure so on the second attempt, I had Ruthie read them out loud to me. Between the two of us, frequently shaking our heads in disbelief, we managed a successful splice. This morning I tried it by myself and was able to produce a relatively fair eye splice in not too long a time. I've almost installed all of the parts that we had shipped to us from San Diego. The new auto pilot is installed but still needs to be sea trialed. The new computer monitor is great and slightly larger than the old one (old! Hah! It had only been installed for six months before it failed. I bought it because it was supposed to be designed for 'rough service'. It's replacement was a third of the price.). We now have a new, shiny boom vang for the main (along with new double braid line and a not-too-bad eye splice) replacing the one that had broke during a nasty uncontrolled jibe. I have still yet to install the new propane sniffer but that shouldn't take too long. All in all, I'm very please with our level of preparation. In fact, it's possible that we're getting too well prepared. Caity and Danny are visiting this week and we're having fun with them. Last night we played Mexican Train for the first time and, suprise! I won. Of course, I was accused of cheating as I was the one who kept score but I referred all accusations to my attorney. They'll never prove a thing. We continue our duties as Coordinators for the 2011 Puddle Jump to the South Pacific and people are being nice to us even when we let a detail or two slip through the cracks. The first boat is leaving for the Marquesas on the first of March and could quite likely be there before we leave. The excitement is building . . . Sounds like you are enjoying a unique splice of life. With Caity and Danny gone the neighborhood is eerily quiet! Was that headline still KNOTS to learn? OK, I'm corny!